Jon Kitna coaches his team at Waxahachie High School. Photo Courtesy: Waxahachie High School. It’s a preseason tradition: Hire a motivational speaker to inspire a group of young men as they get ready for the upcoming football season. In this instance, former NFL quarterback Jon Kitna was called upon. But the question he presented spotlighted an urgent subject beyond the Xs and Os. Speaking in front of the Valor Christian High School (Highlands Ranch, Colo.) football team in late August, Kitna said he believes the attributes of manhood are greatly lacking in young men today. After 16 years playing for the Seahawks, Bengals, Lions and Cowboys, Kitna turned in his helmet and cleats to fulfill his calling and deliver a message aimed at transforming boys into men. Kitna returned to his high school alma mater, Lincoln High School in Tacoma, Wash., in 2012. Effecting change wasn’t easy. According to Al Jazerra America, 82 percent of the students there needed free or reduced lunches. In several surrounding neighborhoods, the median household income was under $20,000. Fathers often were absent from their families at home. First, Kitna surrounded himself with trusted friends and family to help rebuild the football program. Next, he spent $150,000 to update the weight room. And he donated his $53,000 game check to the school in 2013 after signing on to be the Cowboys backup quarterback for the final game of the season. Several former NFL teammates, like Carson Palmer, Calvin Johnson and Tony Romo, also financially chipped in. The pillars are: rejects passivity, engages with God (empathizes with others), accepts responsibility and leads courageously. Each one embodies the life of David from the Bible, as he’s described as being a man after God’s own heart. Rejecting passivity is the first pillar highlighted from David’s battle with Goliath in 1 Samuel 17. Kitna believes engaging with God is more than just attending a weekly church service; it’s developing an intimacy with God that mirrors David’s written words in the book of Psalms. The next pillar is accepting responsibility, and Kitna points to fatherlessness among one of the greatest areas where many men fall short of this pillar. David accepted responsibility when Nathan called him out for committing adultery with Bathsheba. The final pillar is leading courageously, and David did that when he grew a group of outcast warriors from 400 to 1.2 million. What was the result of implementing the pillars to the young men? In the three years Kitna was at Lincoln High School, the football team’s GPA increased from a D average to a B average. The squad also won back-to-back league titles. The wins on the field were great, but Kitna gets more satisfaction from seeing one of his players get a high SAT score or ace a chemistry test. “When a kid comes to you and says, ‘Coach, I got a 1450 on my SAT and I can go to whatever college I want,’ there’s not a touchdown or a game I’ve ever won in my life that will compare (to) seeing that young man’s face when he tells you that,” Kitna says. In 2015, Kitna departed the Pacific Northwest to Waxahachie High School, which sits 30 minutes south of Dallas. There, he’s focusing on coaching full-time. And with the pillars firmly in place, the impact has already been felt on the scoreboard. After going 2-8 the year prior to Kitna’s arrival, the team improved to 6-4 in 2015 and ’16. But winning under the Friday night lights isn’t the ultimate goal; it’s living the Gospel and leading people to Christ. That’s the ultimate mission statement Kitna tries to live and wants others to follow. Adams, Justin. 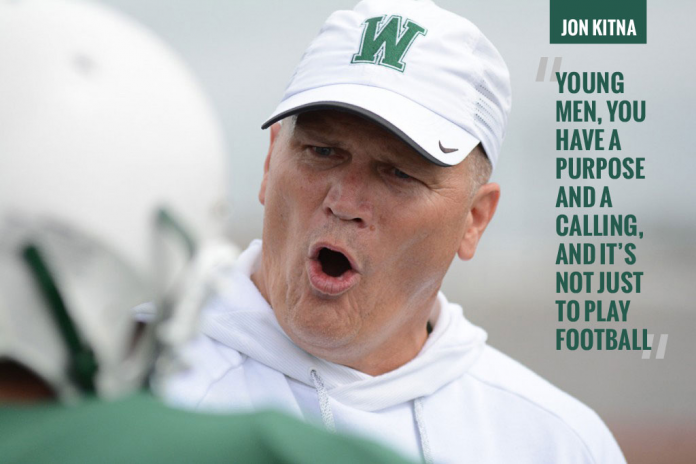 "Four Pillars of Manhood - Former NFL QB Jon Kitna is transforming boys into men"
." Sports Spectrum, 19 October 2017, https://sportsspectrum.com/sport/football/2017/10/19/four-pillars-manhood-former-nfl-qb-jon-kitna-transforming-boys-men/ Accessed 3 January 2018.